Jim chose to live in Salinas, Ecuador, because of its low cost of living and spring-like weather. Taking my life overseas wasn’t something I had planned on doing, but once I discovered the freedom of remote working, it became inevitable. Twelve years ago, I was working as a computer and network engineer for a major corporation. But as time went by I began working more and more with remote clients. It finally got to the point where all of my clients were in different cities and states. I pointed this out to management, and gradually I was able to move to working from home on a full-time basis. It didn’t take long to realize that it didn’t matter where I was working, as long as I had good internet access. So, my wife (who could do most of her job via cellphone) and I began taking working vacations around the U.S. and the Caribbean. We would work from our hotels during the day, and explore in the evenings. 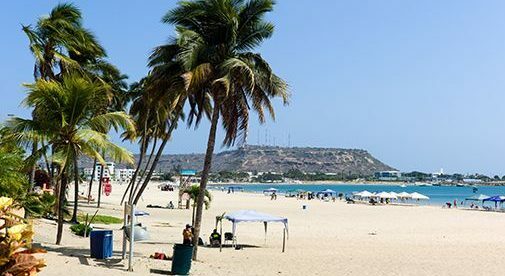 After discovering the beauty of Ecuador in 2013, we made the decision to move to the popular Pacific coast beach resort of Salinas. It was an easy transition. Not only was I living right on the ocean, in a part of the world with year-round summer weather, but I was earning a high salary, and the move to Ecuador caused our monthly expenses to drop to about a third of their previous level. It was this easier way of living that led me to my next move. I decided to walk away from a steady paycheck in a corporate role to start earning on my own terms instead. I “retired” at age 57, and started looking for work that I could do online, whenever I wanted, wherever I wanted. Ecuador is a terrific place to start such a venture, especially here on the coast in Salinas. For one thing, I can keep my expenses very low. There is a great local bus system that costs me 30 cents a ride, and cabs are plentiful and will take me anywhere on the peninsula for $2 to $5, so there is no need to own a car. I can walk to the local Mercado, where I can buy fresh produce so cheaply that I can’t carry more than $20 worth home without help. There are similar savings on meat, eggs, and seafood—most fish is $2.50 per pound for fillets, and big shrimp are $6 a pound. The weather is a big plus as well. We only get four or five rainy days a year, so there’s no pressure to finish what I’m working on in a hurry and I can get outside while the weather is nice: it is almost always a good time to go outside. Living so close to the equator, our days and nights are 12 hours long, year-round, and this has an interesting calming effect. There is a timelessness to having the days all the same, and a feeling that there is plenty of time to get things done. I eventually started freelance writing. Ecuador also makes it very easy to find new and interesting subject matter. The country is only about the size of Colorado, but has an incredibly diverse biosphere. I can leave the coast and be looking at snow-capped mountains in the Cajas in a few hours. I can shop in the quaint streets of Otavalo in the morning, and attend a symphony orchestra that evening in the modern, cosmopolitan city of Quito. The bottom line is that I’m no longer concerned with the bottom line. Since embarking on this path, my wife and I have been all over Ecuador, and have seen everything from beautiful beaches to stunning crater lakes at 12,000 feet. It is hard to believe that just six years ago, I was looking at a future of working until I was 65 or 70 at a job I didn’t particularly enjoy, just so I could live a modest retirement in the U.S.
Today I’m 60 years old and trying to decide whether to visit Santiago in Chile, plan some hikes around Patagonia in Argentina, or to get in that Galápagos trip we’ve been meaning to make. None of this would have happened without the move abroad, and the decision to leave the nine-to-five world for the life of the digital nomad.